Volunteer Marin Blog | Be the Change. Volunteer. There are three interesting opportunities to choose from this week here at Volunteer Marin. Whether you are searching for an opportunity to meet like-minded individuals, or have family members you’d like to invite along in the spirit of community service, we have three projects from which you can choose. This Saturday evening we have Friends of Mt. Tam’s summer astronomy lectures. Andrew Fraknoi, professor of astronomy at Foothills College, will be lecturing on, “The Top Tourist Sights of the Solar System: Where Bill Gates’ Great-Granddaughter Will Go on Her Honeymoon.” Highlights include the Verona rupes, vast escarpments on the surface of Uranus’ moon Miranda, as well as the recent discovery of steam geysers on one of Saturn’s moons. Volunteers are needed to help set-up equipment and guide attendees to the lecture space at Mt. Tam’s Sidney B. Cushing amphitheater. Volunteers are expected to be on-site from 8:00 p.m. – 11:00 p.m.
Back on Earth, pressing community needs also call for volunteer assistance. Wednesday, we have two projects that provide unquestionable value for those requiring both shelter and food assistance. LIFT-Levántate, in partnership with the SF-Marin Food Bank and Marin Community Clinics, runs the Health Hub, located in the Canal district of San Rafael. Help other volunteers distribute fresh produce and other food items to low-income residents, participate in fun kids’ activities and attend free health screenings for diabetes. In Novato, help Habitat for Humanity build homes for working families. At the new Mt. Burdell development, volunteers do everything from hammering nails to pouring the foundation. You’ll be given an opportunity to learn construction skills, meet new and interesting people, and give back to your community. Volunteers must be a minimum of 16 years of age to participate. You can sign up for the project here. If you know someone who represents the spirit of volunteerism and giving that we all strive for, please let us know! The Center for Volunteer & Nonprofit Leadership, in partnership with the Marin Independent Journal, submits candidates for Volunteer of the Week, which profiles local heroes who give back to their community. We are always looking for unique and interesting stories, so please share any ideas of whom you think has what it takes to be our next volunteer of the week. You can find the submission form located here on our website. You can read the most recent profile detailing the many contributions of Dr. Tina Gabby from SummerAde, which seeks to connect disabled children with teenage mentors at local summer camps. Each week the Marin IJ features a profile of local heroes embodying that spirit of volunteerism we should all strive for. A Special Thank You to All Our Volunteers! Here at CVNL, we want to take this opportunity during National Volunteer Week to celebrate and thank all our volunteers who have supported our Volunteer Marin program and the volunteer services we offer to the community. We are always in need of volunteers who are hard-working, passionate, and dedicated to social change & helping others. Our volunteers always answer the call! From our FLEX program Project Leaders and volunteers, to those who provide support for events like the Volunteer Fair and Marin Human Race, we are eternally grateful for the kindness, care, and professionalism that our volunteers show. It is the support we get from volunteers that strengthens the foundation of our volunteer programs and enables us to support the needs of our communities. It is an honor for our organization to work with such great, invaluable individuals. To all the people in Marin who do volunteer work, we would like to thank you on behalf of the Marin community. Volunteer work strengths our community, making it a safe, compassionate, & beautiful place to live, so we thank you for your commitment of time and energy to volunteering in Marin. To all the nonprofits that work with us, we hope that you will take the time to thank you volunteers for all their hard work. National Volunteer Week is this week, from April 12-18. It was established in 1974 and is spearheaded by Points of Light, the world’s largest organization dedicated to volunteer service. This nationally-celebrated week aims to inspire, recognize and encourage people to seek out imaginative ways to engage in their communities. It is about demonstrating to the nation that by working together, we have the fortitude to meet our challenges and accomplish our goals. It is about taking action and encouraging individuals and their respective communities to be at the center of social change – discovering and actively demonstrating their collective power to make a difference. National Volunteer Week has grown exponentially each year, with thousands of volunteer projects and special events scheduled throughout the week. We look forward to continuing to work with our volunteers, as well as meeting new volunteers through our programs and projects. We would love for you to get involved in celebration of National Volunteer Week, so check out our recurring FLEX projects and other volunteer opportunities posted on our Volunteer Marin calendar. Happy National Volunteer Week & Thank You Volunteers! Comments Off on A Special Thank You to All Our Volunteers! Thanks to all of you who attended the 1st annual Marin County Volunteer Fair on Saturday. We estimate that over 500 people attended to connect with over 35 nonprofits and hundreds of volunteer opportunities. We would really like to thank our presenting partners, The Buck Institute for Research on Aging, Marin Health & Human Services, and Civic Center Volunteers, for teaming with us to make the Volunteer Fair a huge success! You can read all about it in the following article from Sunday’s Marin Independent Journal. Don’t worry if you missed us. You can still go to www.VolunteerMarin.org to connect to hundreds of volunteer opportunities in Marin. We plan to be back next year. With 39 nonprofits at the Marin County Volunteer Fair Saturday, Monique Turner flipped through each agency’s display like pages in a catalogue, until the opportunity to work with seniors caught her eye. Turner, a retired Novato resident, was among more than 300 opportunity seekers who turned out for the volunteer fair at the Buck Institute for Research on Aging in Novato. The event, which was a kick off for national volunteer week, was the first time the Center for Volunteer and Nonprofit Leadership partnered with the Department of Health and Human Services, the Marin Civic Center and the Buck Institute to host a collaborative fair. And while the fair presented a variety of opportunities, from art to counseling to recreation — for volunteers of any age and background — Turner, a retired registered nurse, fit the profile that the Buck Institute was interested in attracting. Timms mentioned that they worked with a psychologist who made a connection with happiness, successful aging and volunteerism. And by linking retired people with agencies that help the elderly, both parties benefit from the experience. Dave Mandel, 74, of Fairfax is one such example. Similarly, Karen Lamb, 71, is retired and looking to improve her livelihood. “When you have involvement with something, it contributes to your quality of life,” the San Rafael resident said. But then there were attendees like Carl Schuler, 46, of San Rafael. He is a U. S. Army veteran and student at the University of San Francisco studying behavioral health. When the event was halfway through, Timms said he was pleased. The Marin Advocates for Children had 10 sign ups. Canal Alliance, which helps Spanish-speaking immigrants get work permits and apply for jobs, had more than 25 people signed up. And Turner, the retired nurse, said she found herself signing up to apply for LITA (Love is the Answer), where volunteers become companions for the elderly in senior living facilities, and for Marin Villages, a community of member-volunteers who rely on each other to facilitate independent living. “I just think there is a huge need for people to help seniors who have needs,” Turner said. “I would go with my dog to visit. I want to be a companion. I just want to hang out with ladies and paint their nails and do their hair,” she smiled. Looking for Unique Volunteer Opportunities? Join us on April 11th for the First Annual Marin County Volunteer Fair! Are you passionate about social and environmental issues affecting your local community? Are you a local business looking to increase visibility and promote volunteerism amongst staff? Did you recently retire and now wish to use your professional skills to elevate an organization to the next level? Please join us April 11 from 10 a.m. – 2 p.m. at the Buck Institute for Research on Aging for the first annual Marin County Volunteer Fair. A collaborative effort by the Center for Volunteer & Nonprofit Leadership, Department of Health and Human Services and the County of Marin’s Civic Center Volunteer and Student Intern Program, the event includes entertainment, food, guest speakers and an opportunity to connect with local nonprofit organizations and agencies for one-on-one discussions about varying topics unique to each organization. We have nonprofits who offer volunteer opportunities to help with everything from invasive plant species to homelessness and other issues affecting local youth. If you are among the first 500 in attendance, will receive a drawstring bag and be entered in a raffle to win prizes, including gift cards to local shops and restaurants. Whether you are a student, a retired older adult, a business owner, or are simply curious about how the current landscape of local nonprofits looks today in Marin, please join us on Saturday, April 11. No RSVP required. Wheelchair accessible. Comments Off on Looking for Unique Volunteer Opportunities? Join us on April 11th for the First Annual Marin County Volunteer Fair! Do You Have an Outstanding Volunteer? Submit Them as a Volunteer of the Week! Non-profit organizations rely heavily on the dedication, commitment, and inspirational work of volunteers. Many wouldn’t be able to effectively run their organizations without them. Because volunteers are so important to all of us, the Center for Volunteer and Non-Profit Leadership has a special honor just for them, called Volunteer of the Week! 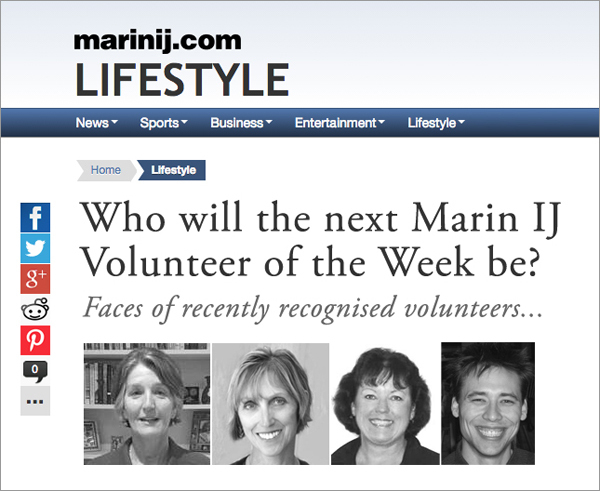 Every Thursday, the Marin IJ publishes a Volunteer of the Week feature on the front page of Lifestyle’s section, and we at CVNL are asking organizations to submit a volunteer who they would like to have featured in the paper, as well as on our social media sites! We want all the non-profits in Marin to know about this opportunity so they can tell us about all the incredible volunteers who are working hard to make a difference. This is a great opportunity to thank your dedicated volunteers, as well as receive some publicity for your agency. It’s a short and simple process to submit a volunteer, as all we need is an agency description, your volunteer’s name, their city of residence, and a brief quote about them. CVNL has also made the process easier than ever by creating a new online submission form. Just follow the link to fill out our quick form: http://goo.gl/forms/fMCeGJM94m. After you submit your form, you will also need to email a photo of your volunteer to mcruz@cvnl.org. Once everything is submitted, your volunteer is ready to be recognized in the Marin IJ! So, non-profits, do you have any outstanding volunteers in your organization? If so, we want to know about them! We can’t want to hear about all the great volunteer work being done in Marin, so submit a volunteer today! Comments Off on Do You Have an Outstanding Volunteer? Submit Them as a Volunteer of the Week! Are you passionate about community service? Take your volunteering to the next level and become a Project Leader for Center for Volunteer and Nonprofit Leadership (CVNL). Project Leaders work closely with CVNL staff to create and sustain recurring community service projects that meet the critical educational, environmental, and human services needs in Marin and Napa counties. Project Leaders communicate with volunteers before and after projects, oversee on-site activities and track hours and attendance. Whether you’re finishing up high school or recently retired, as a CVNL Project Leader, you’ll have the opportunity to learn more about the local nonprofit landscape, meet new and interesting people in the community and be a part of positive change! Are you ready to lead? Attend the next Project Leader orientation on Tuesday, February 3 from 4 PM to 5 PM and submit an application by Friday, February 6, 2015. Click here to register for the orientation session! Before the session, complete a Project Leader application and email it to volunteer@cvnl.org by Friday, February 6, 2015. How: Click here to register for the orientation session on Feb. 3 and complete an application by Feb. 6.